The Kāwhia Kai Festival is a major event on the township's calendar. 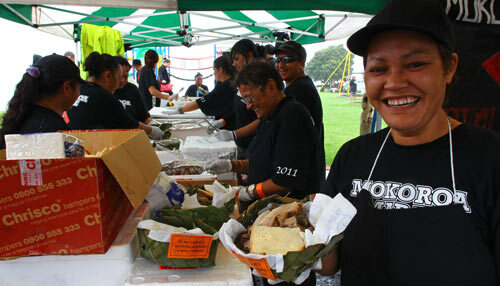 The festival is a celebration of Māori food from the land and sea and is held on the weekend closest to Waitangi Day each year. It is a popular event. In 2010 around 10,000 people attended – Kāwhia's resident population is less than 400. As well as eating delicious food, visitors are entertained by kapa haka performances and flax weaving, carving and tattooing demonstrations. These people are preparing hāngī (earth oven) food.